controlled by the speed rating of the tires ordered. All vehicles with 22.5" and 24.5" tires have speed governed to a maximum of 75 mph (120 kph). A few aggressive tire tread patterns may have lower maximum speed ratings that limit governed speed to 65 or 55 mph - see tire company specifications for details. dimensions 10 3/4" x 3" x 3/8"
drain and steps under cab on front passenger side. Provides clean back of cab. section modulus 17.93 cu. in. 001 lbs. and above. Trucks that are used primarily to tow a trailer may be liable to Federal Excise Tax (FET) - check with IRS for guidelines. 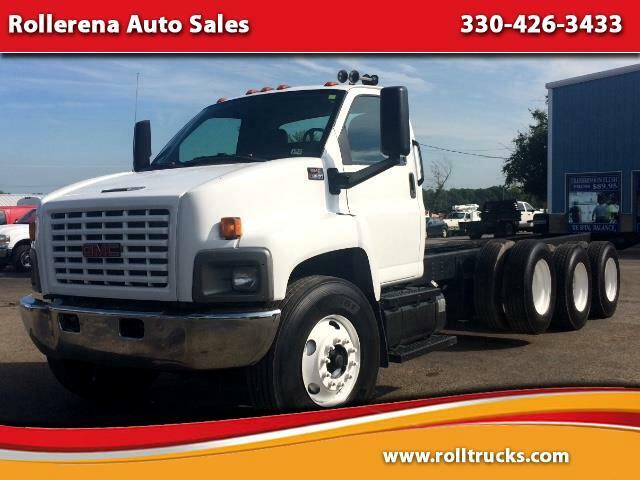 Message: Thought you might be interested in this 2006 GMC C8500.